Villa Barranco del Puerto is a fabulous villa located in a truly privileged elevated position on the outskirts of the cosmopolitan resort of Nerja. Villa Barranco del Puerto is a fabulous villa located in a truly privileged elevated position on the outskirts of the cosmopolitan resort of Nerja. With its advantageous prominent setting, a mere 3.5km uphill from the sparkling coastline and within a five minute drive into the centre of Nerja, we consider Villa Barranco del Puerto to be the perfect holiday villa, close to the beach, shops and restaurants, yet blissfully peaceful and with staggeringly good views. The exteriors are really stylish, with one of the smartest private swimming pools in the area, and the adjacent barbecue and Al Fresco dining area oozes elegance and comfort. Inside, the living area is adorned in a modern and sophisticated fashion, with comfy sofas and a selection of delightful bespoke furnishings, a real home from home. With a number of distinctive features including a shaded area for children to play, we believe Villa Barranco del Puerto will prove to be a popular choice for all the family. Once we actually got to the villa, it was very nice, with a lovely pool. But there were a number of issues, which we will expand on later in this review. We really loved the Villa, the rooms we big and bright and the facilities were exceptional. Great villa for families the don't mind being off the beaten track!!! 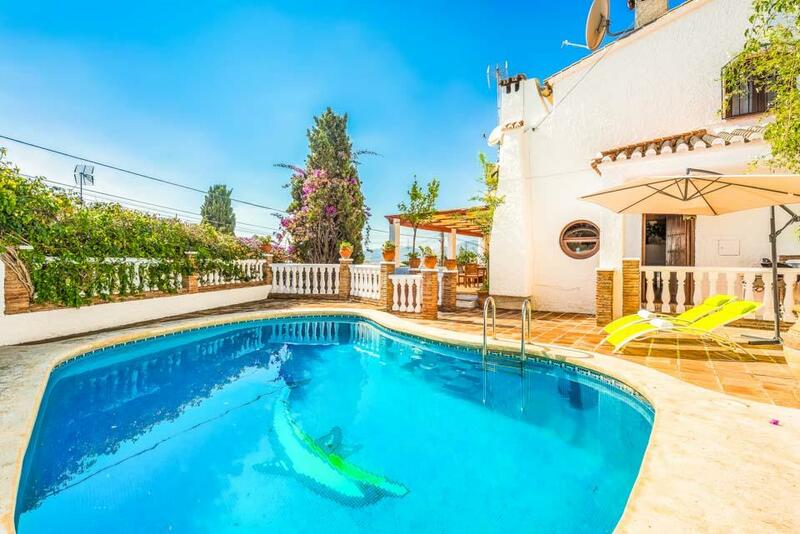 The villa is located in a rural / agricultural area overlooking Nerja. 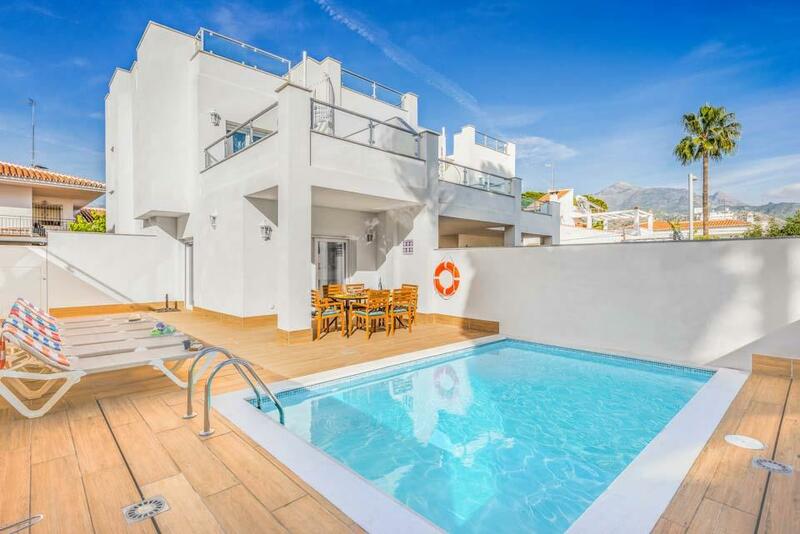 It is hard to find at night (if you follow the written location instructions.these could be much clearer and a map would help), but once you find the right track and arrive you have a secure and remote mountain-side villa offering peace, privacy and fantastic views of Nerja and the surrounding mountains. Nerja is only about 2 miles away and the Lidl supermarket is within very easy reach and stocks all you need. There is even a decent service station just as you exit the motorway in which you can pick up provisions if arriving late. The villas construction and layout is of good quality using nice materials with thick wooden doors, barred windows, integrated fly sheets and nice flooring. Its all been done very nicely and the views are beautiful. Equipment levels are reasonable and the layout is great. Another plus point was that the WiFi is excellent. The negatives are few but would include a rough track drive up to the villa (be prepared), a pool that is not heated (although clean and thoroughly adequate...just a little nippy), and the matresses on the beds, which we found to be extremely firm. Anyway we had great holiday thank you. It was an ideal place to relax in the sunshine by the pool and we thoroughly enjoyed our stay...it was excellent value for money. Villa was large and well equipped. The decor was very nice and the pool was an excellent size and there was lots of outdoor space. The view of the mountains and sea was great. Air conditioning was very welcome. Nice amount of towels available. A real home from home. We were very unhappy and disappointed with the electricity cable right next to the villa which spoilt our view and had seemingly been airbrushed out of the publicity shots. Villa was large and well equipped. The decor was very nice and the pool was an excellent size and there was lots of outdoor space. The view of the mountains and sea was great. Air conditioning was very welcome. Nice amount of towels available. A real home from home. Excellent villa in a great resort. Well maintained,equipped and clean villa. Comfortable beds, good wifi, lovely outside spaces and nice views. The only slight downside is that there is a track from the main road to access the villa, although it is drivable in a normal car but a little bumpy. I would definitely stay at this villa again. **Save up to 25% by arriving and departing on the standard changeover day**Located in the quiet residential Buganvilla urbanization, Villa Clarence is a delightful three bedroom detached villa set in an amazing location, walking distance to amenities,..